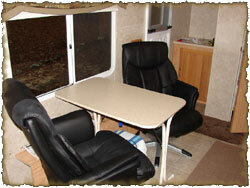 If you are looking for ways to mod your RV, take a look at all the ways we have modified ours! If you'd like to see larger and additional mod images, just click on over to the RV mods picture page. Our off brand bat wing just wasn't doing the job, so we upgraded to the Jack Digital TV Antenna. Wow!! What a difference! There just is no comparing the 2 antennas, the Jack outperforms the bat wing by a huge margin. You can see the write-up we did when we installed it. We removed the plastic Thetford toilet because it was too low, plastic and cheaply made. 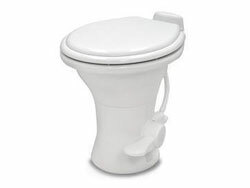 We installed a new Dometic 310 (Sealand) toilet that is taller, porcelain, foot flush and has a residential size seat. 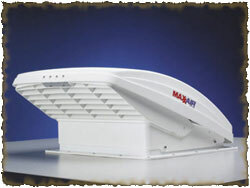 We swapped out an ordinary roof vent for a MaxxFan 5100K from MaxxAir. 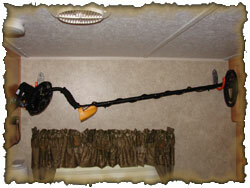 It can pull air in, blow air out and act like a ceiling fan. It is very quiet and moves a ton of air. It can even operate when it is raining. 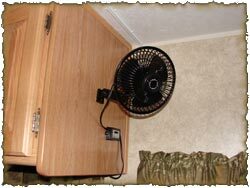 If you need ventilation in your RV, get one of these! Read the MaxxFan review. 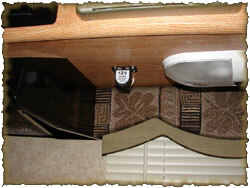 We added an infra-red backup camera to our motorhome along with a 7" LCD color display. 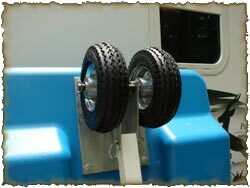 It is great for keeping an eye on our enclosed trailer while traveling down the road as well as for backing up. You can get you one by clicking here. 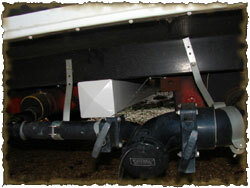 In an effort to prevent leaks around the cab-over windows, we installed EXE RV Gutters. Installation is ssuper easy and takes very little time. Anything to prevent a leak is worth it to us! We hated the white slide panels in the door that blocked our view so we replaced it with a clear version. Installation is a snap and the result is amazing. It is so nice to be able to see outside through the whole door. You can order a set of the clear panels by clicking here. We went ahead picked up an Oxygenics shower head. We got white since the chrome one didn't really match the camper. The chrome knob you see is a water cutoff valve so we can stop the flow during the shower to save water. It's easier than twisting the control that came with the shower head. 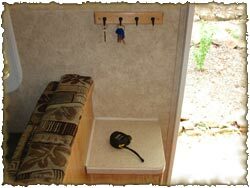 Space is precious in our little camper so we added a triple hook hanger over the bathroom door. 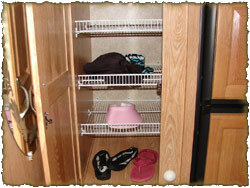 It's great for hanging a towel, a shirt or whatever we want to keep off the floor. Not sure where we originally got it but here's a link to one at Amazon. Cynthia wanted a wall calendar so we got her one. It is magnetic and uses dry erase pens. We also got a magnetic and dry erase note board... which also has a cork board for sticking things up. It's mounted behind her chair so she can easily manage it. Cost was about $27 at Staples for both items. Here's a similar item. 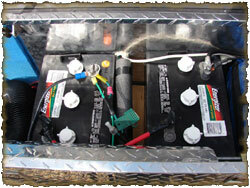 We finally got around to replacing the puny 12v battery that came with the camper. These GC2 batteries from Sam's were $50 cheaper than Trojan T-105s so we decided to give them a try. We'll update the blog if we ever have an issue with them. Until then, we are glad to have a them installed. We're ready to boondock! You can browse GC batteries and accessories here. The 12v fan we got at Walmart vibrated worse than... well, something that was made to vibrate. 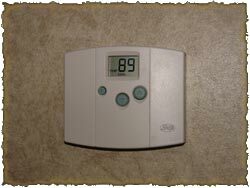 We replaced it with a Vornado v103 Under Cabinet Air Circulator. This thing really does the job. 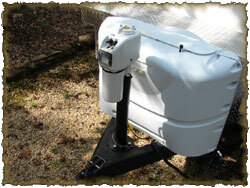 It folds up when not needed, swivels and has 2 speeds. 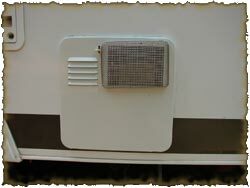 It has a very low amp draw so we can use it while boondocking plus it is great for white noise while sleeping. Read the Vornado review. 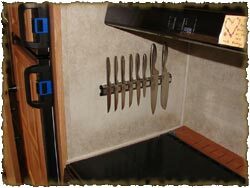 Cynthia bought a really good set of knives for the camper but they came in a big butcher block holder. There's really no place to keep that thing plus it weighs a ton. We decided to get a wall mounted magnetic holder to keep the knives on. It had to be very strong so the knives wouldn't fall off during travel. We opted for the Chicago Cutlery magnetic knife holder. No one likes to clean the black tank, especially Cynthia! So to make things easier, we added a black tank rinser that will allow us to squirt water into the rear of the holding tank to flush it out after dumping the contents. There is an inlet just above the sewer hose connection where we attach a garden hose. This is routed to the tornado mounted in the holding tank. Quick, easy, no mess and all for under $30. Get yours here! 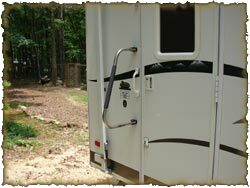 Mmmm, I just love cleaning black streaks off the camper sooo much.... NOT! 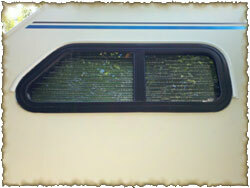 I hate it; don't like it at all... so I added RainKap Black Streak Relief to the camper! Now I won't have black streaks nearly as often. It took about an hour to install along the side and rear and was fairly simple to do. 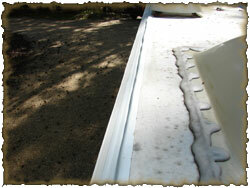 All edges of the roof were covered with Eternabond as a preventative measure. Click here for another view. We needed a place to plug in our 12v fan and our 12v appliances near the kitchen sink so I added a simple 12v outlet under the cabinet. I drilled a small hole and routed the wires into the upper cabinet where there were many 12v wires to tap in to. You don't really notice the outlet unless you squat down and look, which is how I was when I took this picture. 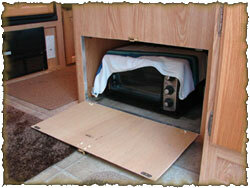 Getting to the storage area under the dinette benches meant we had to remove the cushions and lift up a board. This was too much work just to get the toaster oven out so I added an access door. I simply cut out the shape, added a latch and hinges and it was done. Cynthia is very happy! Therefore, I am happy. Note: We have since replaced the dinette with 2 chairs. Not all places we go have full hookups so we added 270 watts of solar power to the camper so we could generate our own electricity. 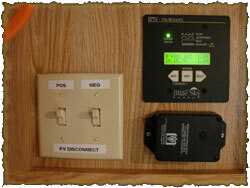 We used Kyocera panels and a Blue Sky Charge Controller. The image here is the Blue Sky remote display. 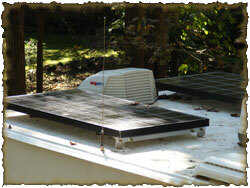 More info is available on the RV solar page. 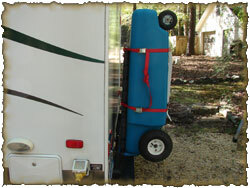 We have 2 propane tanks on the camper with an automatic changeover regulator. We added a remote indicator that is mounted inside the camper which will blink when the system changes tanks alerting us that one is now empty. We can disconnect that tank and go fill it while the other tank still provides propane to the camper. 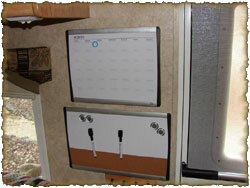 Most RV accessory dealers carry the remote indicator by Marshall. Storing the sewer hose in the rear bumper is not a good idea. 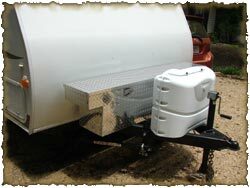 The bumper will eventually rust away and as it does, it will tear pin holes in your sewer hose. Then you'll have a mess on your hands, literally. I bought a 6' piece of PVC fence post from Lowe's and 2 end caps. 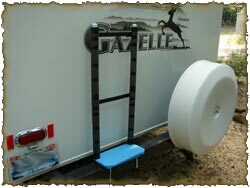 I attached it to the frame under the camper using plumbing hangers. Now the hose is safe and right where I need it to be when I need to use it. I am too old, lazy or something... but cranking a manual jack handle in 95° heat or a cold rain isn't for me. Apparently, it is not for Cynthia either. Sorry, honey. :) I did my homework and decided on a Barker VIP 3500 electric tongue jack. I called the company to ask where I could purchase a weather resistant cover and they offered to send me one out at no charge! Barker has earned a lifetime customer. 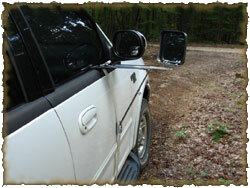 The stock mirrors on our tow vehicle just didn't quite do the job. I was about to buy a new set of McKesh mirrors when I spotted a pair on eBay for $25. They seem to be an older style but still work as intended so I don't mind a bit. It's always nice to save a little money where you can... especially knowing what I am spending on solar! We needed a collapsible ladder to have with us in the RV and those skinny telescoping ones with plastic locks isn't what we wanted. Thankfully we found the Werner Model 13T that is strong, tall and folds down to a very manageable size. If you're in the market for a tough ladder with at least a 300# rating, you really should consider this one. I desperately needed a way to keep our metal detector up and out of the way; found the solution using Tornado EZ Ancor drywall hooks available from your local Lowes. 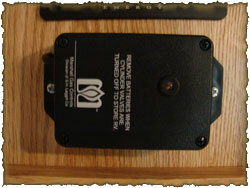 Easy installation with just a screwdriver and the mounts can hold up to 30 pounds, way more than the detector weighs. 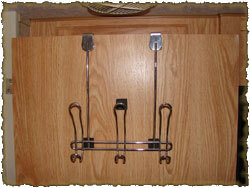 Other style hooks are available. What a money saving device! I can now see just how much electricity an item is using when it is running and when it is turned off. I found out my electric heater uses 35% less power when the thermostat is turned down just one notch. And my TV still draws lots of juice even when it is turned off (now we unplug it). 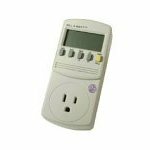 If you are looking to find the energy hogs in your home or RV and want to reduce your electric bill, then get yourself a Kill-A-Watt Monitor! I picked up a simple 12v fan to install in the camper for use when boondocking. I hardwired it and mounted it on the cupboard end so that it faces the bed. Makes a very nice breeze when turned on but it vibrated too much. Note: This has been replaced with a 110v Vornado V103 fan used through the inverter. I modified a simple hand truck to make it into a bumper mount carrier for my Barker portable holding tank. 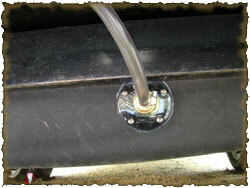 The foot is mounted to the bumper using 4"x5" u-bolts. The top of the handle was cut off with a hacksaw and capped with plastic covers. Foam pipe insulation for padding on the support using black electrical tape to secure it. An old camping sleep mat was used to pad the foot that the tank rests on, Gorilla Glue secures that to the foot. Grrr. 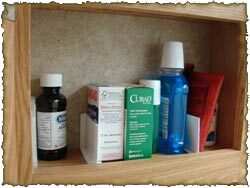 Each time we arrived at a camp site, everything in the medicine cabinet would be in disarray. I picked up a set of Shower Splash Guards and cut them to fit the cabinet. I used double sided tape so they stick in place and keep things from falling over. I think I deserve a Nobel prize for this mod - LOL. We needed a place to keep our towels and the wife's bathroom products since the space under the sink is small. I stopped by Lowes and picked up a pre-made 36" shelf and 3 brackets for about $13. 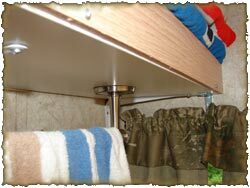 The towel bar was already in the camper; I just removed it from the wall and attached it to the underside of the new shelf. 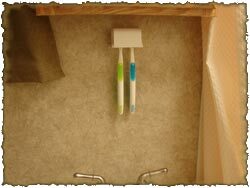 Another shot of the new shelf in the bathroom with a towel bar attached to the underside. The new shelf has a 2" lip on it to prevent things from falling off during travel. I had a bulb burn out in a tail light so I decided this was a good time to switch to LEDs. 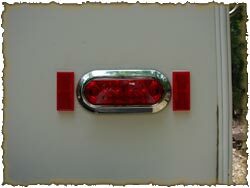 I ordered a set of surface mount LED tail lights from eBay and also a LED license plate light. They installed easily although they didn't match the existing holes. They are very bright and look much better than the factory tail lights. $40.00 well spent. Other options are available here. I went to Lowe's and picked up this box for $148 plus tax. I moved my propane tanks forward and put my single 12v battery inside the box. One day when I switch to 2 6v T-125 batteries, they'll replace the one in the box. This is an easy mod albeit time consuming. A new plastic tank cover completed the project. Now I have more storage space, woohoo! 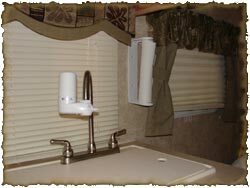 The lighting inside the camper draws a lot of power and generates excessive heat, and let's not forget the yellow light it produces. I went to eBay and ordered these (search for "36 SMD 1210") from Hong Kong. Half the price of anything else I could find with free shipping! Two lights draw less than 1A and the light is a crisp, bright white! Now to order enough for every light in the camper from here. Here's a shot of the new LED lights on. The lights are such an improvement over the incandescent bulbs that came with the camper. 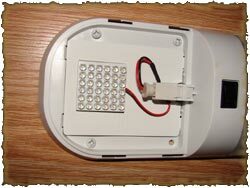 The new LEDs get hot to the touch (there are 36 lights crammed onto the circuit board) but nowhere near the heat of the old style bulbs. At just under $10 per light, they are a bargain compared to other LED lights. Shipping takes a full week as they do ship from Hong Kong but shipping is free. 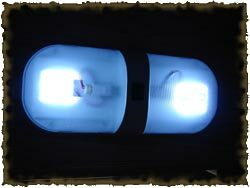 You can also browse a huge assortment of RV led lights here. 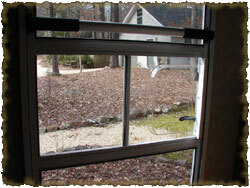 Too many times we accidentally grab the plastic slide when trying to close the screen door. We ordered this Camco unit and installed it in under 5 minutes. A drill, bit and screwdriver are all you need. It is very sturdy and a very useful mod. If you don't have one yet, you might want to consider getting one. 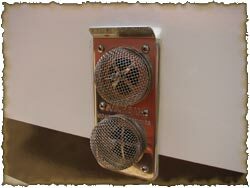 A permanent solution to annoying holding tank odors! This replaces the standard vent cap and uses the wind to pull all the odors and methane from the holding tank, out through the roof top vent, away from the living space. 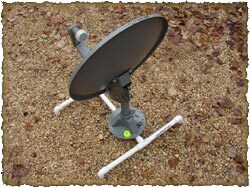 There are two basic models to choose from, Camco or Cyclone. I chose this Camco model solely on price as they both seem to do the same thing. Easy install using a few simple tools and some Dicor. 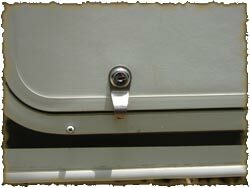 The trailer came with a single coat hook on the other side of the door, but keys wouldn't stay on it while traveling. Spotted this while in Lowe's and figured it would do the trick. It matches the camper and just two screws hold it in place. You can also get them here. Bought this little jewel and installed it right away. I replaced the OEM unit with the model 42995B (also see this model). Installation was quick and easy, blue and red wire are not used, yellow to yellow, brown to green, white to white and green to Rh/Rc. Fired right up and as you can tell from the picture, it was a hot one today. Glad to get this mod completed! A smart surge protector that protects against surges, low and high voltage, reverse polarity, open neutral, AC frequency, accidental 220v... all with a remote display. I may go my whole life and never need it, but it's cheap insurance against common electrical problems. You can read about the unit here. You can browse all the models here. This picture shows the remote display. 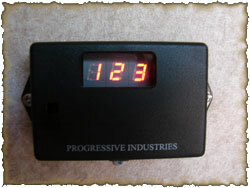 It shows voltage, amps and error code, if any. 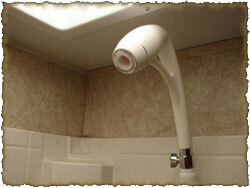 The main unit is mounted behind the tub. Yep, our camper came with the ever so common CH751 keys for the storage compartments. We trekked on down to Home Depot and picked up a set of "keyed alike" file cabinet locks and promptly installed them. Took about 5 minutes to do and the only tool needed was a small pair of channel locks. I'm really considering the Combi-Cam locks, no key to keep up with. 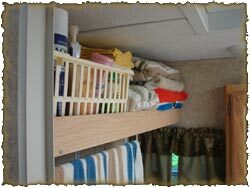 There isn't much space to keep bottles of soap, shampoo and conditioner so we opted for a wall mounted unit. 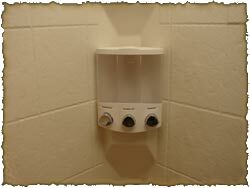 We simply empty the bottles into the dispenser and now it is at our fingertips while we shower. 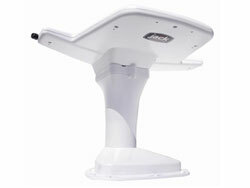 This and other models are available at local retailers as well as online. Screw it to the wall, the tape won't hold it if it is full. We looked all over for a covered toothbrush holder for 2 toothbrushes that was wall mounted and finally found one. Every other one we saw was not covered. It comes with adhesive tape but that doesn't hold well on wallpaper. We used 2 small screws to secure ours. It is available from Amazon.com if you want one for yourself. We saw these little racks and knew just where to put them! 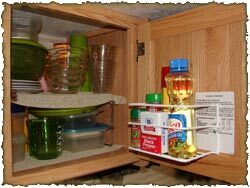 Now those spices we use most often are held safely and conveniently inside an upper and lower cabinet door. We found these at our local RV parts dealer, you can purchase them here. Another alternative is this little unit. We wanted an alarm clock that projected the time onto the ceiling so we didn't have to roll over to see what time it is. We've had one at home for years and had to have one for the RV. 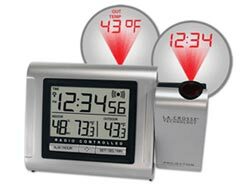 We found this model that also has a wireless outdoor temperature sensor so we can see how hot/cold it is outside without opening a door. This model is just what we needed. It is available from Amazon.com, you can see a better model here. The RV mattress that came with the camper just wasn't cutting it. We finally tossed it and purchased this 8" memory foam model from Amazon. Wow, we are so happy with this purchase... our best mod yet in our opinion. Nothing beats a good night's sleep! 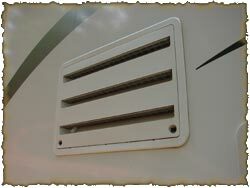 This is a Maxxair FanMate 800 vent cover we added over the Fantastic Fan in our trailer. We wanted this because it allows us to keep the factory vent cover open even when it rains. 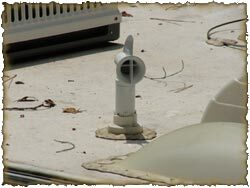 It also protects the factory vent cover from hail damage. 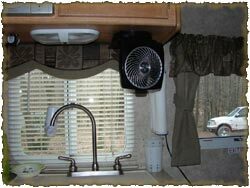 The front vent on our camper did not have a motorized fan so we didn't need a bigger cover. 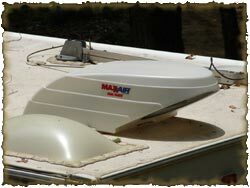 We installed the new Maxxair II vent cover here because it allows us to keep the factory vent cover open even when it rains. It also protects the factory vent cover from hail damage. If you've read the rest of the site, you'll know that I am crippled. That's disabled, handicapped or physically challenged if you are politically correct. They all mean the same thing, not sure why people feel better using alternate words - LOL. 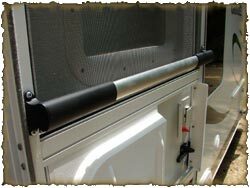 Anyway, I added this assist handle so I can get in and out of the camper a little easier. If I stumble or slip, I'll have something to hang on to so hopefully I won't fall... again. 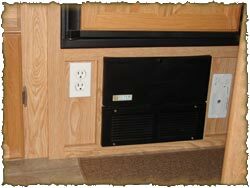 I wanted an outlet in the camper that went directly to shore power without going through the camper electrical system. I went to my local building supply store and bought the wire, outlet, plugs and connectors and installed them. There is a male connector near the rear bumper that I plug into an extension cord from the shore power. Now we can run our 1500 watt electric heater or the toaster oven. 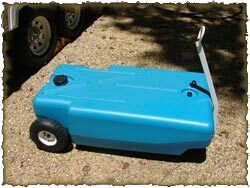 This is our Barker portable holding tank. Now we can dump our tanks when there is no sewer hookup at our campsite. This is much easier than moving the camper just to go dump the holding tanks! As you can see, I removed the plastic rear wheels and replaced them with pneumatic tires. Had to make a new axle out of 5/8" cold rolled steel and drilled holes for cotter pins on each end. Coated the new axle with grease to prevent rust. 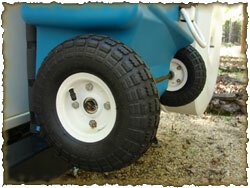 Here's a shot of the new pneumatic tires we ordered from Access Casters (part #6PPN62). Made a new axle 3/4" longer than the original out of 1/2" cold rolled steel. As was the rear axle, this one was coated in grease to prevent rust. Now the tote pulls much easier and much quieter. Just say NO to plastic wheels! Had to keep the critters out of the furnace so screens were in order! I have a Suburban furnace so these are the little screens I used. Once you put them on, you never have to mess with them again. Very easy to install, also. These vents are often overlooked since you have to squat down to see them. But you do not want wasps or mud daubers getting in there and setting up a homestead. These screens keep them out! I did have to use a little clear caulk to cover the corners where the screens didn't fit exact but no bug is going to get in there now. As with the other screens, these are extremely easy to install. I have a Suburban water heater so this is the screen I went with. It does a great job of keeping insects out so I don't have bug related problems in the future. I thought about installing a large water filter by the water pump but didn't want to fiddle with it come winter time, so I opted for a faucet mounted unit. Another choice is this one. They work great, very lightweight and filters are available virtually everywhere. Also, take note of the conveniently placed paper towel holder. It's an el cheapo from Wal-Mart but it does what I need it to. 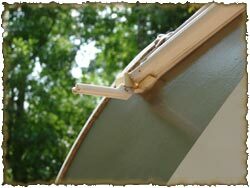 This handy little gadget makes rain from your gutter fall out and away from your camper instead of running down the side making black streaks. 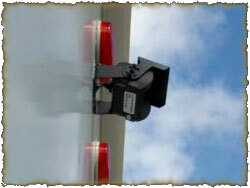 It just clips on to your existing gutter and will stay there even at highway speeds. I am so glad I bought these! You can get them here. Larger and additional mod images are available on the RV mods picture page.